The 5,200-square-foot building will be built adjacent to Heller Road, just south of the Kerr Hall pedestrian bridge. 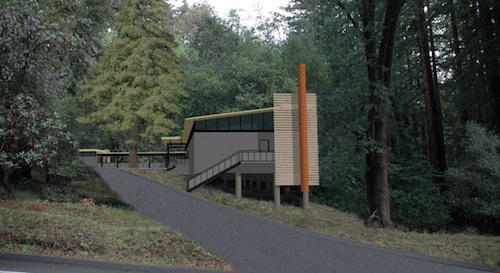 UC Santa Cruz is set to start construction next year on a building to process and temporarily hold waste generated by teaching, research, and campus maintenance activities. The nearly $20 million Environmental Health and Safety Facility, funded by the state through the UC Office of the President, will help ensure the campus continues to comply with state and federal regulations. The 5,200-square-foot building will be built adjacent to Heller Road, just south of the Kerr Hall pedestrian bridge. "Fulfilling the campus mission goes beyond the classroom and laboratory, and includes the hard work of staff members who help support faculty and students at our university," said Sarah Latham, vice chancellor for Business and Administrative Services. "This new facility will improve our waste management from labs and reduce processing costs." The project went out for a 30-day public review today, part of the California Environmental Quality Act process. Construction on the Hazardous Materials Staging Facility is expected to start in the second half of 2017 and end in December 2018. As with all campus buildings, architects have designed the facility to blend in with and minimally disrupt the natural landscape. Currently, lab waste is directed to two different interim facilities, one on Science Hill and one at the base of campus. This project will consolidate the management into one site. Patrick Goff, executive director of Environmental Health & Safety and the Office of Emergency Services, said all other UC campuses, except Merced, have built similar facilities. "This facility is an investment in the important research conducted every day at UC Santa Cruz," Goff said. "The building will reduce the risk that comes with transporting hazardous material to different sites on campus, as well as increase our efficiency and reduce costs." The facility will be used to manage chemical waste and low-level radioactive waste. UC Santa Cruz has instructors and researchers in the life sciences, physical sciences and fine arts, who use chemicals in their work and generate waste that needs processing and disposal. In addition, chemicals are used to help maintain the campus. Chemical waste is packaged and labeled by trained researchers and staff, and is collected once a week to bring it to the holding facility. Within 90 days, a licensed contractor transports the chemical waste to an approved and permitted treatment, storage and disposal facility. Additionally, some researchers in the life sciences and physical sciences use low-level radioactive materials to carry out experiments and educate students on certain techniques. The campus annually receives less than 100 milliliters—or less than 3 ounces—of radioactive material for research. Natural radiation is all around us. For example, living in Santa Cruz exposes a person to about 647 millirem of radiation every year. Lifestyle choices, such as smoking, can expose a person to much more. A pack a day adds up to about 25,000 millirem in a year. UCSC's radiation workers, including researchers and staff handling radioactive waste, typically receive doses below 10 mrem per year from their work.